More than 100 years would pass before coal would come to the attention of investors. Then in 1845, several companies did become interested in the coal deposits along Big Coal River from Dartmont to Peyton. They soon formed the Coal Navigation Company which locked and dammed the river so steamboats could come up as far as Peyton. Active mining operations began in 1847. The coal was then shipped to points on the Kanawha River and other places where coal oil was distilled from it. Mining continued until 1884, when it became commercially unprofitable to produce coal oil because kerosene had become cheaper to purchase. An interesting sidelight of the early mining industry is the fact that it brought to this area an influx of diverse ethnic groups. Most of the miners were Irish with a sprinkling of English and Scots. After the initial years of mining ceased, timbering became the principal industry, beginning about 1885 and continuing until 1900 when prime usable timber became scarce. With the building of the railroad into the county, the coal industry experienced a come back and remains the states number one coal producing county. Coal Mining is Boone County’s greatest economic resource. In 2003, Boone County underground and surface operations produced more than 29,674,000 tons of coal. 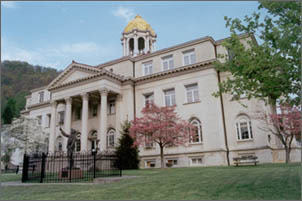 While visiting Boone County you will want to visit the Courthouse. Constructed in 1921 on a hillside, the building is located in a small square just above State Street in the town of Madison. The Boone County Courthouse is a stately, monumental, three-story building designed in Neo-Classical Revival. A Sentinel stands on the courthouse lawn and honors all Boone County coal miners. There are a number of recreational activities available in Boone County. Waterways, a water themed park has become one of southern West Virginia’s most visited recreational sites. The water park has all the ingredients for a day of fun and relaxation. Activities include water slides, a lazy river and a swimming pool. Located just off Corridor G, near Julian, the Waterways Park also has many other activities including a go-kart track, a 3-D archery range, picnic shelters and a miniature golf course. For more information about Waterways call 304-369-6125 or link on to http://www.waterwayspark.com/.